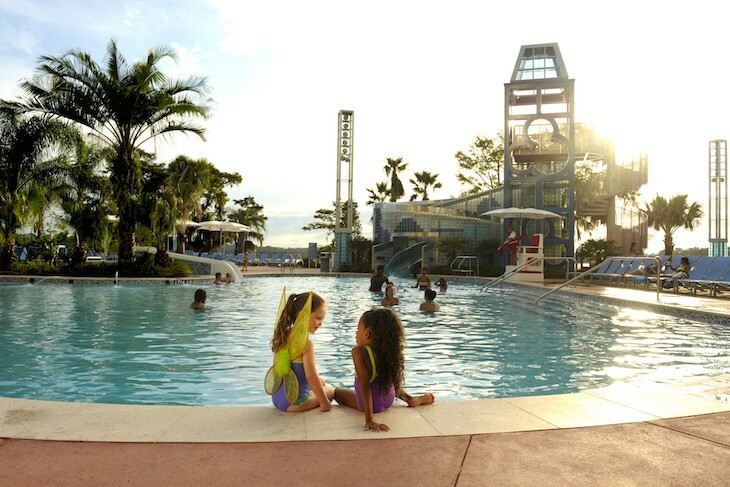 This sixteen-story Disney Deluxe Villa Resort adjoining Disney's Contemporary Resort offers dramatic views of the Magic Kingdom® Park, the Seven Seas Lagoon, and Bay Lake. 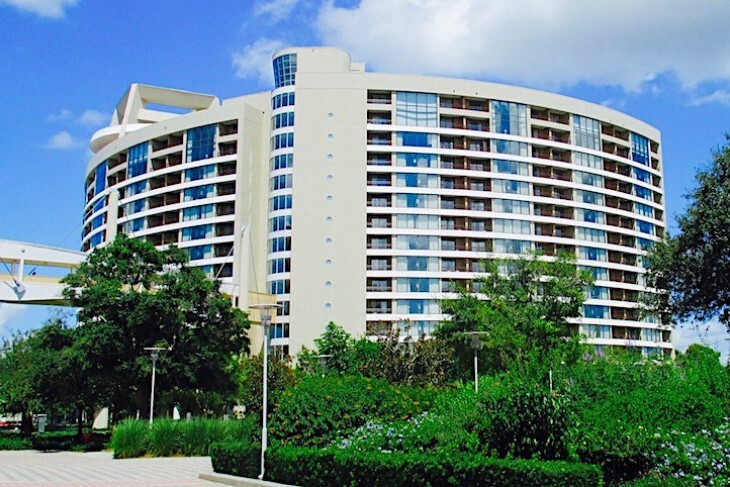 Its crescent shaped tower linked by pedestrian sky bridge to Disney's Contemporary Resort has access to the monorail and all the Magic Kingdom area has to offer. 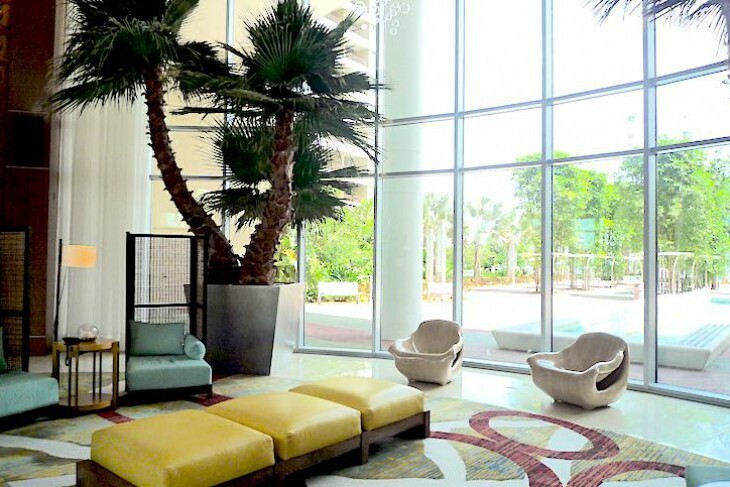 The resort’s small, circular lobby is bright and sunny due to huge glass windows with ultra contemporary seating, tropical palm trees, and a flirty glass bubble chandelier hanging overhead. Just outside the lobby is an outdoor area faintly Asian in design with dramatically lofty bamboo and a sparkling fountain that leads to the pool area and Bay Lake. 428 units. 4600 North World Drive, Lake Buena Vista, FL 32830; 407-824-1000; Fax 407-824-3539. Check-in 3 p.m.; Check-out 11 a.m.
A Deluxe Villa property with monorail access. Perfect! The pool area faces Bay Lake. A king bed and balcony are big pluses here. One area of the master bath has a whirlpool tub and single sink set; in the other area is the shower with chic hardware and splashes of glass tile, the commode, and a small corner single sink. Villas here are impressive with modern furnishings that are soothing to the eye. Contemporary artwork adorns the walls, and stylish charcoal gray carpeting (beginning to show wear) adds a soft look to the rooms. An electronic safe, DVD player, iron and ironing board, Pack ‘n’ Play, coffeemaker, vacuum, and hairdryer are extra amenities included in each. One irritation is that ice machines are found on only three of the fifteen floors, what I consider to be an unbelievable inconvenience. While studios units are pleasant they are a bit small at 356 square feet. 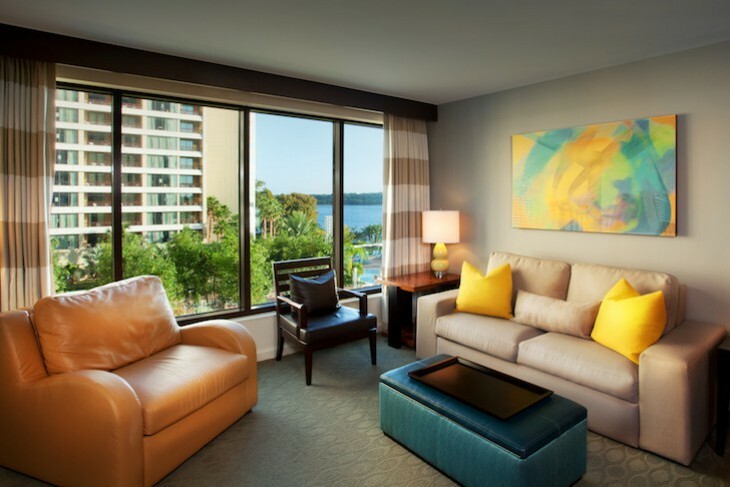 Decorating the room is a queen bed topped with a soft white duvet and a gold and pumpkin-hued bed runner along with a sky blue leather ottoman coffee table, two-person dining table, full-size bureau over which is a located a wall-mounted, flat-panel TV, and a beige sofa sleeper with celery-colored throw pillows. In some units, off the entry hall is an open, somewhat cramped room where on one side is the mini-kitchen with wet bar, pullout pantry, under-counter refrigerator, and microwave, and, strangely enough, on the other side a bathroom vanity with a single sink (you’re never sure whether to wash the dishes or wash your face), commode and tub being down the hallway. 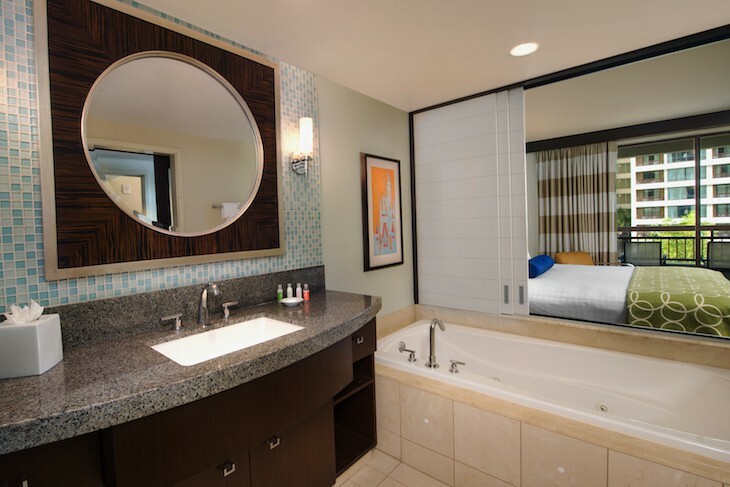 Other units have the bath and sink in one area with a separated mini kitchen in another. A balcony adjoins the living area (first-floor units come with a patio instead). Striking one-bedroom villas are 727 square feet. The kitchen has contemporary, dark wood cabinets, sea blue backsplash, and taupe granite countertops with stainless steel refrigerator, dishwasher, stove, and microwave. A granite island features two yellow leather bar stools and just opposite is booth-dining seating four. An adjoining living area is furnished with a dove gray sleeper sofa (also starting to show wear due to the light color) adorned with bright yellow pillows, blue leather oversized ottoman/coffee table, a sand-colored leather sleeper chair, chocolate brown occasional chair, and a bureau over which is mounted a flat-panel TV (turn on channel 20 to hear the accompanying Wishes fireworks show music). A sliding door leads to a balcony or patio also accessed from the bedroom. Off the foyer is a full-size bonus bath with a smallish corner single sink. You’ll also find a stacked washer/dryer in the hallway. In the bedroom is a king-sized bed with an interesting black and white woven leather headboard intermixed with dark wood. A kiwi green runner tops a white duvet with a punch of nautical blue in the bolster, and two glass-topped black side tables flank the bed. A dark wood bureau with a white cabinet front holds another flat-panel TV and built-in luggage rack, and there is a very small closet near the bath. You’ll also find a vanity-style marble desk and a leather and chrome occasional chair. One area of the marble master bath has a whirlpool tub and single sink set in a taupe granite vanity backed by a wall of shimmering glass tile; in the other is the commode and a frameless glass shower with chic hardware and splashes of glass tile. The only thing lacking is a makeup mirror. A two-bedroom suite is simply a combination of the one-bedroom and a studio at 1,080 square feet. Some are dedicated units with the second bedroom offering two queen beds and no mini-kitchen. 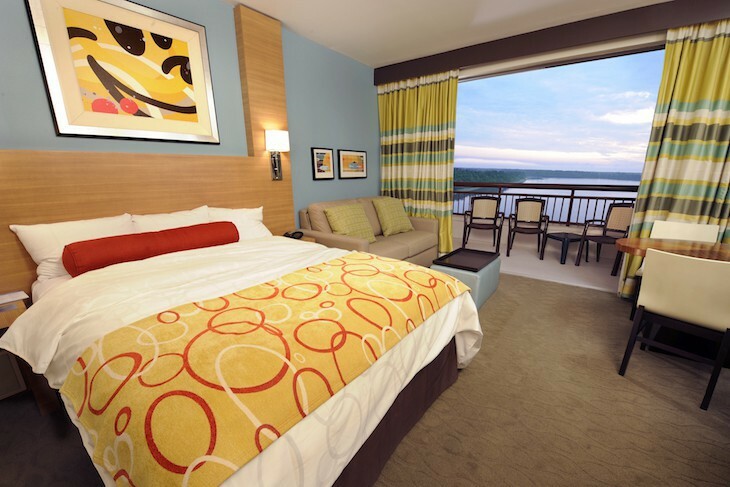 With 2,044 square feet the spectacular Grand Villas offer magical views from the top floors (fourteen in all with six Magic Kingdom and eight Bay Lake views). 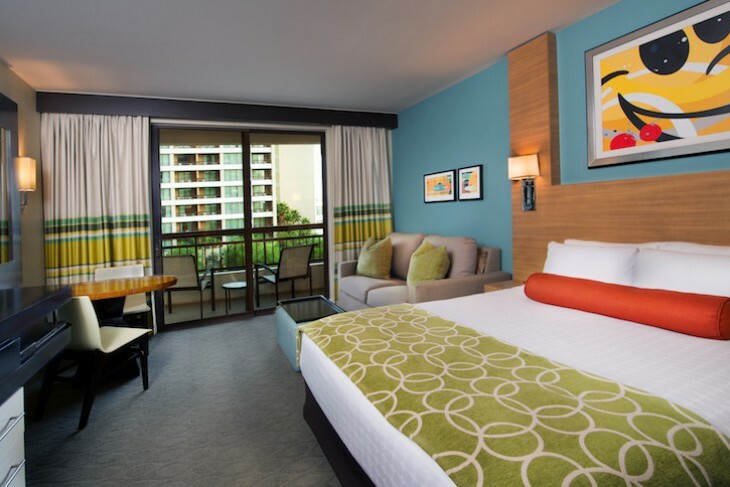 Although these are the exact same layout as the Grand Villas at Disney's Animal Kingdom Villas – Kidani Village, Bay Lake Tower villas seem larger because of the sunny interior and lighter décor. The very first thing you notice as you walk into the villas is the amazing view, so heavenly that you’ll simply refuse to lower the shades. There are three bedrooms and four baths on two levels. The kitchen, dining area, living room, master bedroom, laundry room, and extra bath are on the first floor. Two bedrooms, two baths, and a TV loft are on the second floor (entry doors are found on both floors). The kitchen is open to the living area with a small island, and there’s an adjoining eight-person dining table with a balcony found off the kitchen. The soaring, two-story living area has hardwood flooring topped with a colorful, contemporary rug, sleeper sofa, two occasional chairs, ottoman-style coffee table, and entertainment center with TV and stereo system. A master, similar to the those found in one-bedroom villas, is just off the living area with its own balcony. Climb the stainless steel cable railing staircase to the second floor where two identical bedrooms, each with two queen beds and balcony, flank the loft TV room with sleeper sofa. Sleeps 12. Villa view choices range from a Standard one with a look at either the parking area or the pool, a Bay Lake View, or a Theme Park View. 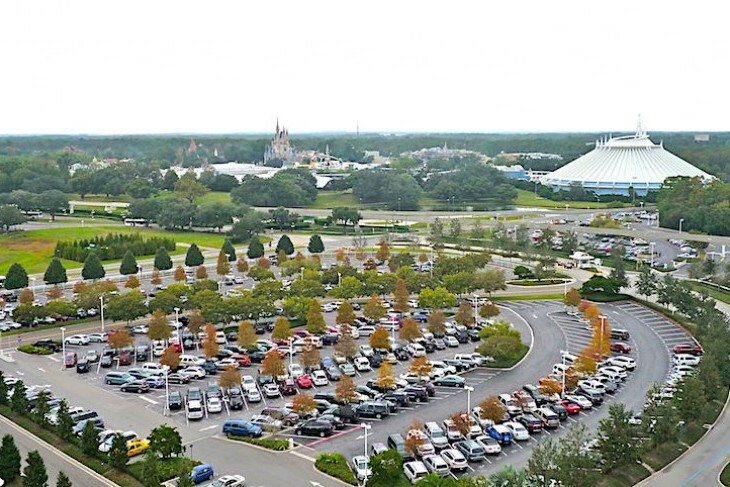 But like next-door at Disney's Contemporary Resort Magic Kingdom views also offer a not-so-nice look of the resort’s parking lot below. Cara's Tip: Those with a Magic Kingdom view villa should request a location on the north side of the building closest to the park which affords a superb vista of Space Mountain and the Castle. On the Bay Lake side request floors nine and above for a distant view of Epcot Spaceship Earth. A few bonus type villas on the far north side are considered Bay Lake View villas and actually have a view of the Magic Kingdom from their balconies only. Be forewarned that the resort’s Top of the World Lounge on the 16th floor is available only to Disney Vacation Club owners (an absolutely ridiculous concept for paying guests not to have access! ).